Your audience is paying attention to social video. Facebook and Snapchat have both beat 8 billion daily video views and 1 billion users on Youtube are watching hundreds of millions of hours of video content every single day. Any brand that is not creating and promoting social video is missing out a huge opportunity. The following is a guide to Social Video, and where it fits in your marketing plan. You don’t have to be a big enterprise with a professional video team to take advantage. Vidian understands what it takes to thrive in the constantly changing world of social video, contact us to improve your social video strategy. Social Video is video content specifically created for driving engagement on social networks. And is as much about the audience, as it is about the platform on which it is distributed. Social video is any video produced by a brand that is relevant to their audience. Whether the goal of the video is to entertain or to educate isn’t necessarily as important as the relevancy of the content. What is the difference between social video and traditional video content? 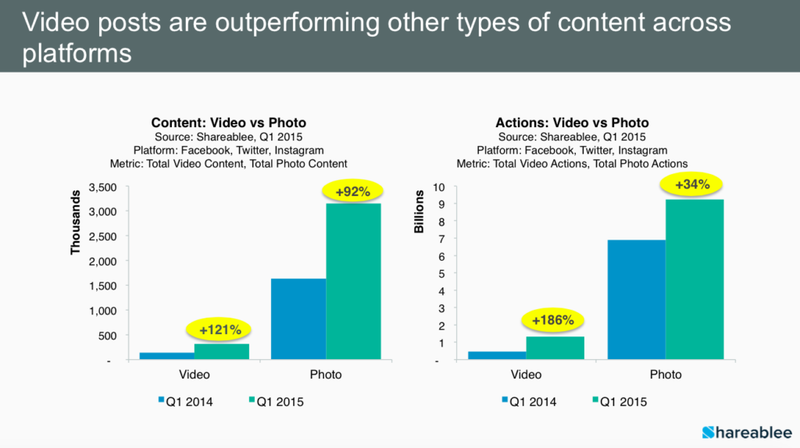 First, social video is optimized for online viewing. With viewers on their smartphones more than ever before, social is video is almost primarily viewed on mobile devices. High viewership on mobile not only affects video size and aspect ratio optimized for mobile viewing, but also the speed and details featured in quick-to-be-consumed social videos. Second, it’s social because this type of video is driven by user engagement like sharing, commenting and liking. A successful social video stops viewers from scrolling further down their feeds and is a measureable point of engagement and interaction. Brands can use video to talk to their audiences and, unlike television, the audiences can talk back. Social video is not necessarily viral video. Sometimes, a successful social video will catch fire and spread across the web in hours. But, going viral should not be the goal of every social video a brand chooses to publish. Rather, social video can and should be part of a larger, ongoing, dynamic strategy to grow and engage your social following through relevant and valuable short-form content. Online video exploded in recent years, and this trend is not expected to slow down any time soon: by 2019, an estimated 80% of all internet traffic will be video, up from 64% in 2014. The total monthly amount of estimated global video traffic in 2019 would take a single person over 5 million years to watch. So, who is watching all this video? In short, everyone. Up from 21 minutes in 2011, the average US adult in 2015 spent over an 1 hour and 15 minutes watching digital video every single day. While video viewing has grown across all age demographics, millennials are the most engaged, with over 92% regularly watching videos online. 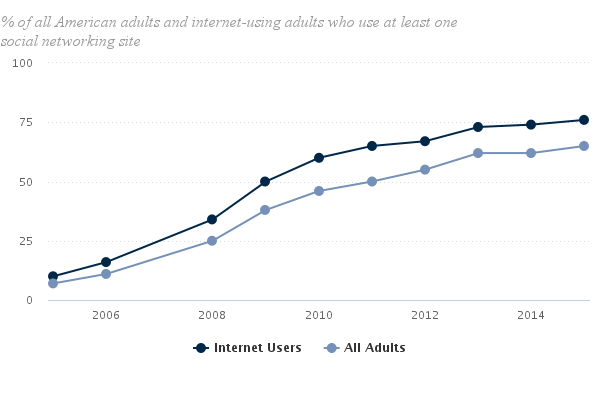 This data signals that video will only grow in importance going forward as video habits spread across all age groups. Video has been a popular storytelling medium for decades, increased data bandwidth and sophisticated streaming technologies have made on-demand viewing on modern communication devices the norm. With 65% of all adults in the US engaging with at least one social platform, social video has become a natural and potent marketing tool. Viewers’ personal programming has evolved, as well. No longer is it curated by network schedules, but rather, it’s comprised of the latest tastes and interests of the friends and brands viewers follow. It’s telling that the two most popular social networks, Facebook and Youtube, are also the largest drivers of video traffic on the internet, with billions of daily views. Videos is incredibly successful on social platforms, commanding four times as many shares as any other type of content. The key to developing a strong video strategy across social networks is understanding how your brand can be part of the conversation and make video content your audience wants to share. This is where you can leverage a content marketing strategy to help provide structure and direction for your social videos. Though not mutually exclusive, content marketing is in many ways in opposition to traditional advertising methods. Rather than promoting a brand or product to a stranger through banner ad, content marketing seeks to build an audience around non-advertisement original content. Content marketing material educates, informs and provides significant value to specific target audience. In this way brands promote themselves in a subtle helpful manner and impact the right audience through high quality content. This content can take many forms, including blogs, webinars, tutorials or whitepapers. Social video is just one medium for delivering content. The key is providing value to potential customers, gaining both their trust and attention in the process. The goal is to ensure the audience finds the content valuable, so they are motivated to follow your page and share what they find about your brand with friends. A viewer who you have turned into an online follower is far more likely to continually engage with your brand and further convert to a buyer. More effective than traditional advertising, content marketing delivers increased site visits, consumption of premium content, online purchases and responses to calls to action. While articles and images are still important strategy components – content diversity has certain SEO benefits and audiences like variety, after all – video is the king of social. Video is the most important strotytelling medium. Video can convery a significant amout of information quickly, teaching and reinforcing the identity of your brand to viewers. Video can invoke deep, emotional responses in a way that other mediums simply can’t. Almost everyone has cried at a movie; the same can’t be said about a blog post. You most likely aren’t trying to make your followers weep, but video has the ability to make someone really feel. Video simply drives social engagement better than anything else. If this were the only reason, it’d be reason enough. Videos demand 62% more likes and comments than other content, and also commands a huge amount of user attention. Facebook touts 8 billion views a day, averaging over 760 years of watch time every day. Most importantly, visual content gets shared as much as 40x more, helping your brand’s message travel exponentially. Mobile-users are especially eager, with over 92% sharing videos on social. Set aside the social performance metrics, there is a reason why television commercials have proven so effective over the last 60 years: because the very nature of the moving image gives you wide latitude to show off your product and create an emotional connection with a passive audience. Studies have shown that people remember 10% of what they hear, 20% of what they read, but 80% of what they see. Communicating your message visually makes it more powerful and longer lasting, so make sure you work hard to maximize the few minutes you will get with your viewers.